I hope on this very cold Martin Luther King, Jr. Day some of you bundled up and ventured out on this cold day to see the campus encased in shimmering icicles. Although TD did not experience a long power outage from the storm, power was out just long enough to make our tower clock run ten minutes behind. So don’t rely on the clock to get you to class on time this week! Speaking of MLK Day, please note the wonderful program for this week, especially this Wednesday 1/23. The theme this year is “Think Globally, Act Locally.” Please go here for more information. 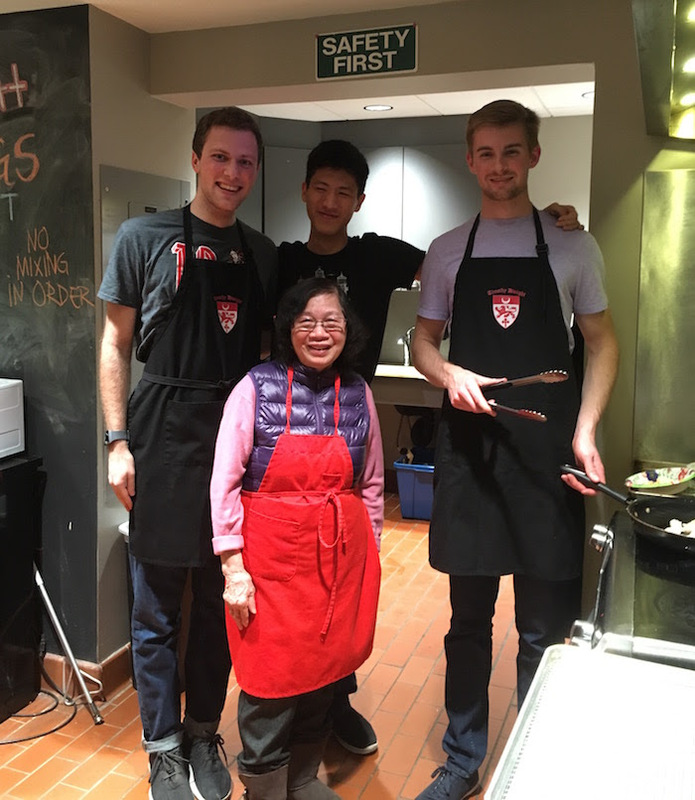 Our “photo of the week” features my wonderful mom, Fung Lui, and our TD Buttery staff and volunteers who helped to lead this year’s “TD Dumpling Night”. We made close to 400 hundred pork and veggie dumplings and quickly sold out in less than an hour! 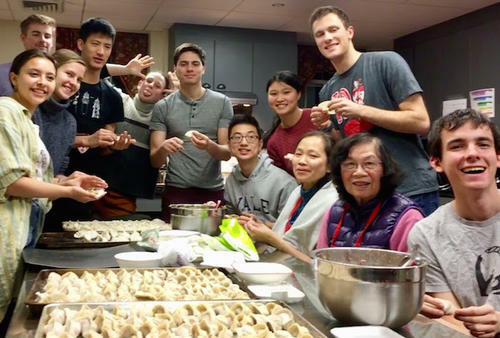 Dumpling Night will be back again next year! Speaking of IRIS, TD College Community Engagement Fellow, Lizzie Dolan TD ’21, announces that the Yale Refugee Project working with IRIS is expanding their youth program to include college and career prep and are seeking more volunteers! She hopes to bring more TD students to work with a new arts event in the TD Gallery to raise more awareness about the presence of refugees within New Haven. If interested, please access the application here. Applications are due Sunday the 27th at noon. Please contact Elizabeth.dolan@yale.edu if you have further questions. Round one of Fireside Chats. All first-years should have already signed up to attend a Fireside Chat on either evening – 1/22 or 1/28. If you haven’t already reserved your spot, please go to this link. Although the Knitting Circle will start closer to 5pm, anyone who needs to buy new yarn, should first meet our Grad Affiliate coordinator, Sumita Ghosh, at 4pm in the TD Common Room to go to Knit New Haven together. The group will then return to the Common Room before 5pm to start the Knitting Circle. Email sumita.ghosh@yale.edu if you have any questions. Round 2 of Fireside Chats. This is the last night so make sure you do not miss it if you signed up. Our spring semester series of Mellon Forum presentations continue! Look forward to fabulous presentations, great food and wine, and conversation! We will meet just about every Tuesday night until early April when your senior essays will finally be due! Another terrific evening of sharing the warm community spirit and talents in the college! The sign-up link was already sent out in a prior email, please make sure to sign up this week to secure your spot to perform! TD is excited to welcome Professor Peter Loge of George Washington University who will be talking on the topic “Return to Ethics in Political Communication.” Professor Loge is the Assistant Director in the School of Media and Public Affairs and has had a long career in Washington, D.C. serving under Senator Edward Kennedy and three members of the US House of Representatives, and in the Obama administration contributing to the passing of the Affordable Care Act. His new book, Political Communication Ethics: Theory and Practice will be due out in 2020 and he will also serve as the Director of the Project on Ethics in Political Communication, which is launching on March 5th of this year. If anyone is interested in going to dinner with Professor Loge after the tea, please email me at mary.lui@yale.edu. January 23, Wednesday: Final course schedules due for the Class of 2022. January 24, Thursday: Final course schedules due for the Classes of 2020 and 2021. January 25, Friday: Final course schedules due for the Class of 2019. January 28, Monday: Final deadline to apply for a spring-term Leave of Absence. See Leave of Absence, Withdrawal, and Reinstatement. Don’t forget this survey from the Yale College Teaching, Learning, and Advising Committee. Interested in STEM research, meeting fellow women scientists, and/or exploring career paths? If so, you won’t want to miss out on Research Chats organized by Women in Science at Yale (WISAY)! Join us on Thursday, January 31st from 6:00-7:30pm at SSS 410 as Tina Su and Lauie Bracaglia, PhD, share their career paths and research. Tina is a graduate student in the Immunobiology Department working in lab that studies novel regulatory pathways controlling immune cell function and their potential application in cancer immunology and autoimmunity. Laurie is a postdoc in the Department of Biomedical Engineering and is working on using nanoparticle-based drug delivery systems to arm blood vessels against immune-mediated injury. Each informal talk will be 30 minutes with time afterward to mingle with students and postdocs in the sciences. Pizza is provided! RSVP here: https://goo.gl/forms/4uSaIP0PJoPOrzaB3. This event is funded and sponsored by Associate Dean Sandy Chang and Science and Quantitative Reasoning Education. Email wisay@yale.edu with any questions. to expand their academic horizons beyond the classroom. must be prepared to teach a six-week long core course as well as two electives that they have developed. $3, 500 over the course of the summer. Interested in sharing your passions with middle schoolers? Splash at Yale is an education outreach organization that runs two programs each semester for students from all over the Northeast. All classes are taught by Yale students, and cover topics ranging from “The Geography of Happiness” to “Epigentics” to “An Introduction to Skepticism.” Teaching is a small time commitment but has a huge impact on our students! On February 16th, February 23rd, and March 2nd, we will be holding a program called Sprout for middle schoolers where you can teach a one hour class. Your class can be a one-time only elective on any of the three weekends or it can be a sequential core class that goes on for all three days! Teacher registration is currently open until January 26th and you can register here. or email us at yalesprout@gmail.com. The Toshizo Watanabe Endowed Scholarship Fund provides financial assistance to undergraduates/graduate students for a semester or year-long study abroad program in either the United States or Japan. A generous endowment gift of $10 million from Mr. Toshizo (Tom) Watanabe to the U.S.-Japan Council makes it possible to award scholarships to students for whom study abroad would not be possible without financial support. The scholarship will support up to the full cost of attendance to the study abroad program of the applicant’s choice. The scholarship program grants awards to recipients in amounts determined by financial need and other qualifications. 2019 marks the second year to support American students studying abroad in Japan, and the fourth year for Japanese students studying abroad in the United States. The application for the 2019-20 academic year is now open. Click here to access the application. Please join our mailing list for more information. Currently in good academic standing at an accredited college or university in the U.S.
(Priority) The priority for the scholarship is undergraduates who are studying abroad for a year or less. Graduate students and international degree-seeking students may also apply, however the maximum amount of an award is $25,000 for one year. For more information on the scholarship’s establishment, please read the press release. For any questions, please email watanabescholarship@usjapancouncil.org.